David Snyder of Michigan enjoys coming to Dooly Campground with the NOMADS so much that he and his wife have been here four different times. They also visit when they are not working. While Dooly Campground trustees want to retain the campground’s rich historic heritage and rustic nature, they also try to update the facility from time to time and add a few more modern conveniences. This spring volunteers have worked to replace light fixtures which produce as much light but use half the electricity throughout the dorms, dining hall, tabernacle and other structures. They have replumbed the preacher’s tent, painted inside several buildings and completed extensive cleaning projects. That work began with the NOMADS, a group of mission volunteers from all over the United States and continued on a recent Saturday with representatives of area churches including Andersonville, Cordele, Perry, Unadilla, and Vienna. Norm Smith heads south every winter, leaving behind his Michigan home. While he enjoys working with the NOMADS in Florida, Georgia and other southern states, he’s ready to go back home in late spring. “This year, I want to see my grandson graduate,” he said. NOMADS (Nomads On A Mission Active in Divine Service) are affiliated with the United Methodist Church and usually are retirees who like to travel in their RV’s and use their skills to improve various UM facilities. They have been coming to Dooly for a number of years, and several in the group of eight that came this spring were making their fourth stop at the local campground. 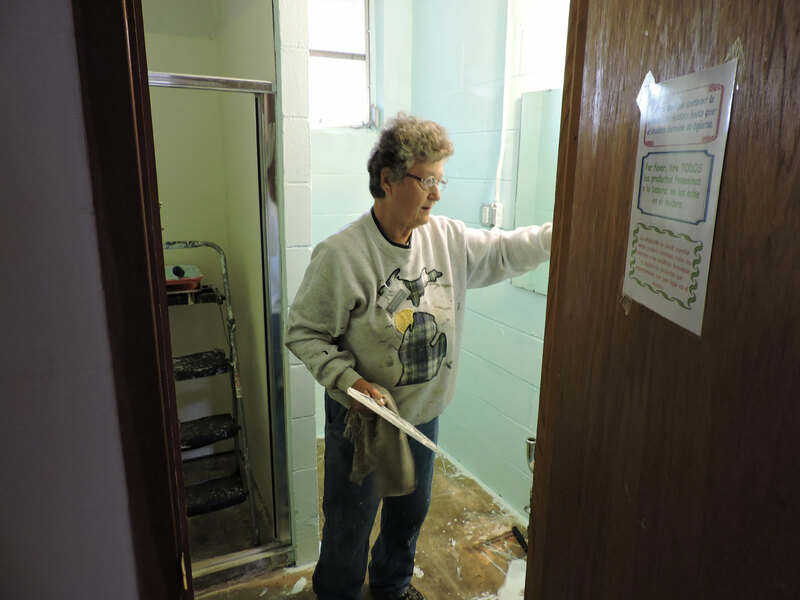 Norm and Pat Smith and David and Patty Snyder leave their Michigan homes every winter and head south where they volunteer for several projects in the southern U. S. Snyder jokes that they are “Northern Old Methodists Avoiding Deep Snow” (NOMADS). This year’s group leader, Paul Favreau of Cornelia explains that NOMADS sign up online for the projects in which they are interested. Some of the 1000 NOMADS throughout the U.S. are full-time volunteers, and others simply choose the projects on which they want to work. “While we are in Florida, we get to visit my husband’s mother,” says Patty Snyder of Michigan. 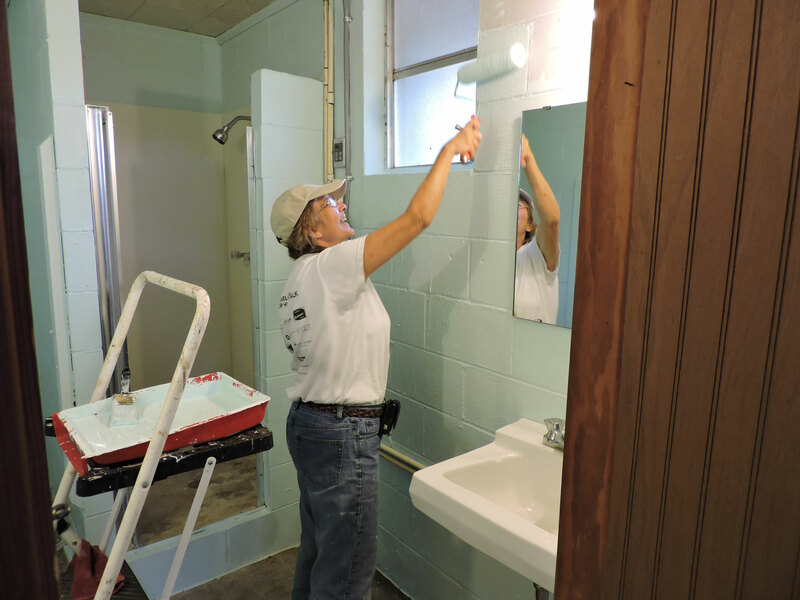 “We love working with other NOMADS and meeting new people.” Here, she paints a bathroom in the preacher’s tent. NOMADS typically work three weeks at the time twenty-four hours each week. At Dooly, Favreau says the campground caretaker gives the group a list of projects that need to be completed. This year, new light fixtures in most of the buildings were the number one priority. Both Patty Snyder and Pat Smith were painting bathrooms in the preacher’s tent when they were interviewed. Ms. Snyder says she likes the opportunity to serve and enjoys meeting new people. Most of the couples who work together are strangers to one another when they begin a three-week project, but by the end of the time, they have become life-long friends. “We love coming here, and even have stopped to visit at other times of the year when we are passing through,” Snyder says. 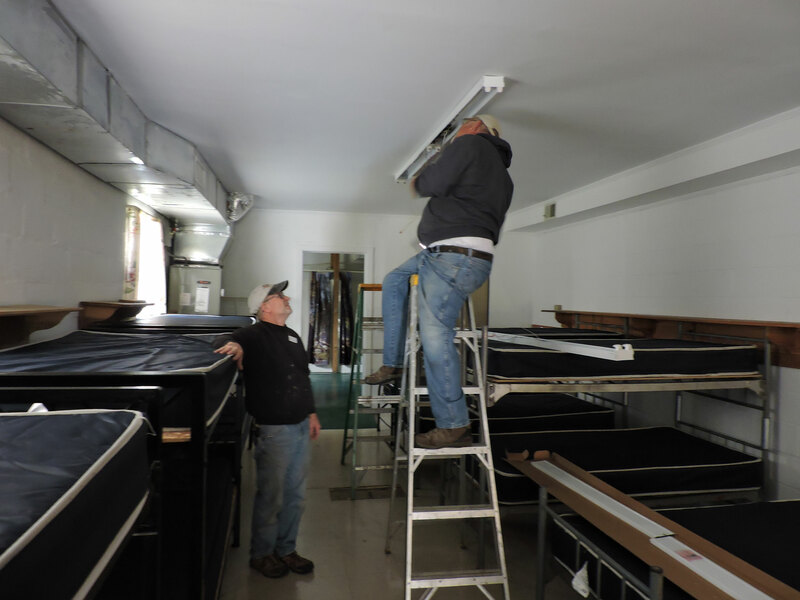 Not all the light fixture replacement was completed before the NOMADS had to move on, so volunteers also worked on that project during the “Emmaus Clean-Up Day” April 11. 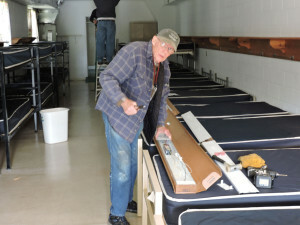 Chris Wooden and a group from Andersonville including Dave Wooden, Theresa Brooks, Stephanie Wooden and eight youth replaced rotten lumber and paneling in the dorms, changed out lights in the same buildings and picked up limbs that other volunteers cut on the grounds. 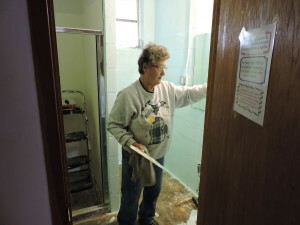 A nurse for 49 years, Pat Smith of Michigan, now enjoys serving other people in a different way. She and her husband, Norm, have worked with the NOMADS 13 years. Wooden said their church always comes to Dooly for a Sunday service during the year, and he also has been involved in the Emmaus Walk. “Dooly Campground is a special place and we’re glad to help out when there are specific needs,” Wooden said. 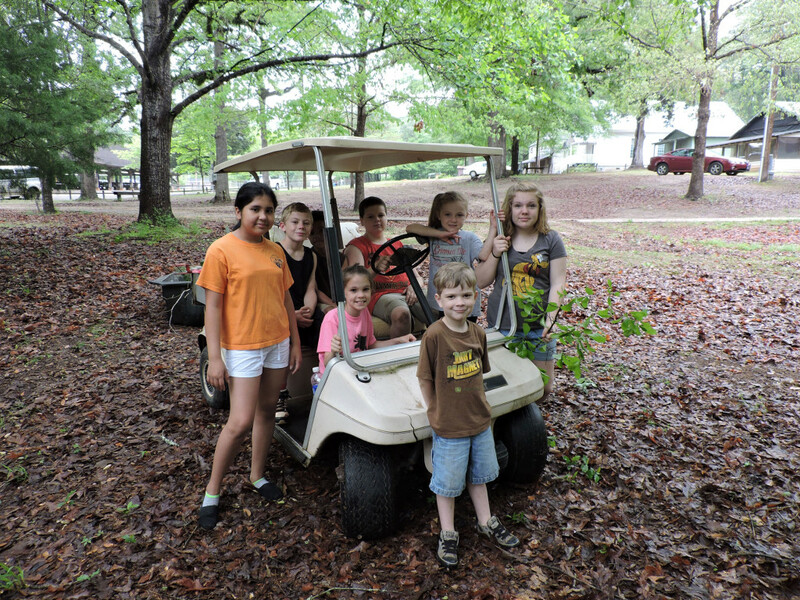 During the clean-up day, Stephanie Wooden used a golf cart to pull a contraption on which the young people piled limbs so they could be hauled to the woods. Several of the youngsters had been to camp at Dooly, and the younger ones are excited about coming this summer. They were especially enthusiastic about helping with the clean-up. Among the pruners were Don Barnes of Cordele, a former trustee chairman and Ricky Hudson from the Unadilla church. Several Unadilla guys including Michael Conner brought a backhoe and other heavy equipment and were busy pushing undergrowth back off the grounds. 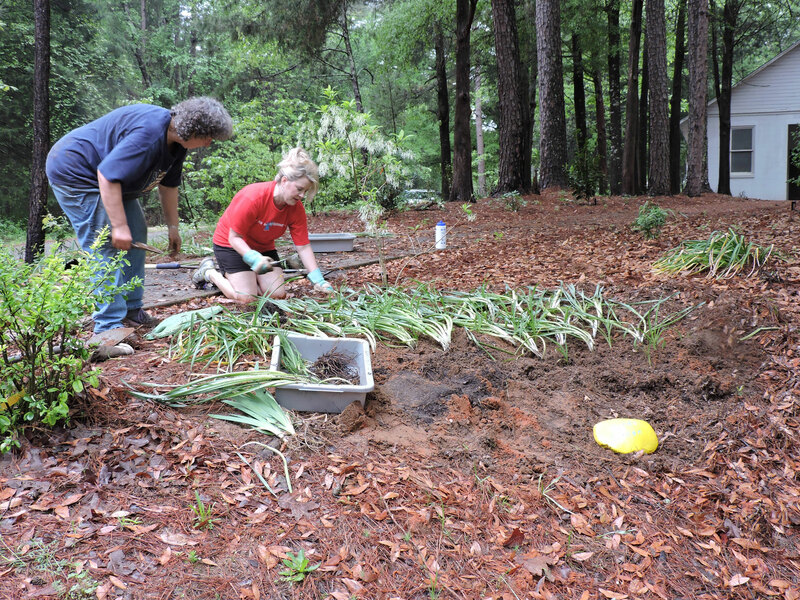 Unadilla UMC members Dinah Grace and Kim Barron plant daffodils in “Ford’s Garden,” which they are preparing in the chapel triangle as part of Ford Durham’s legacy. Durham served on the campground trustees some 38 years. Eventually, Barnes added, an old shed on the property which is no longer used will be demolished as the trustees make room for future development. Several ladies from Unadilla and Vienna were busy beautifying an area around the chapel. 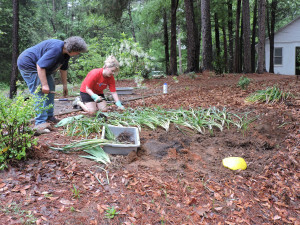 Kim Barron and Dinah Grace created “Ford’s Garden,” a tribute to Ford Durham who served as a campground trustee about 38 years, but now resides in an assisted living facility. Ms. Barron said Mr. Ford’s daffodils always were so beautiful, so bulbs were taken from his yard, and she and Ms. Grace transplanted them in an area at the campground as part of his legacy. Bob Greico, also of Unadilla, and his wife, Kimberly spent their Saturday pressure washing the wooden fence around the tabernacle and the benches at the cross. Gloria Conner, one of the trustees, told him, Grieco said, that someone from the Unadilla church had donated the fence, and it needed some upkeep. Besides pressure washing, the Greicos also were replacing a rotten board or two. 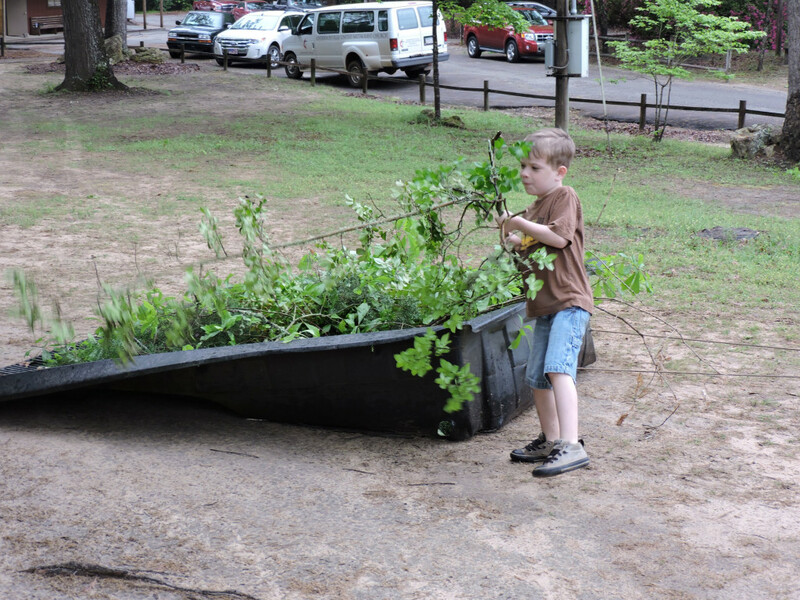 Andersonville UMC youth Gage Wooden, Jayden Wooden, Weston Wooden, Blake Dunn, Chloe Wooden, Melanie Wooden, Kristin Wooden and Litzy Lepiz were anxious to help with the clean-up day because of past and future camping experiences. These young people ran all over the grounds picking up pruned limbs and discarding them in wooded areas. Children from Andersonville filled a sliding contraption with limbs that were hauled to the woods. One of their mothers, Stephanie Wooden pulled the contraption with a golf cart. 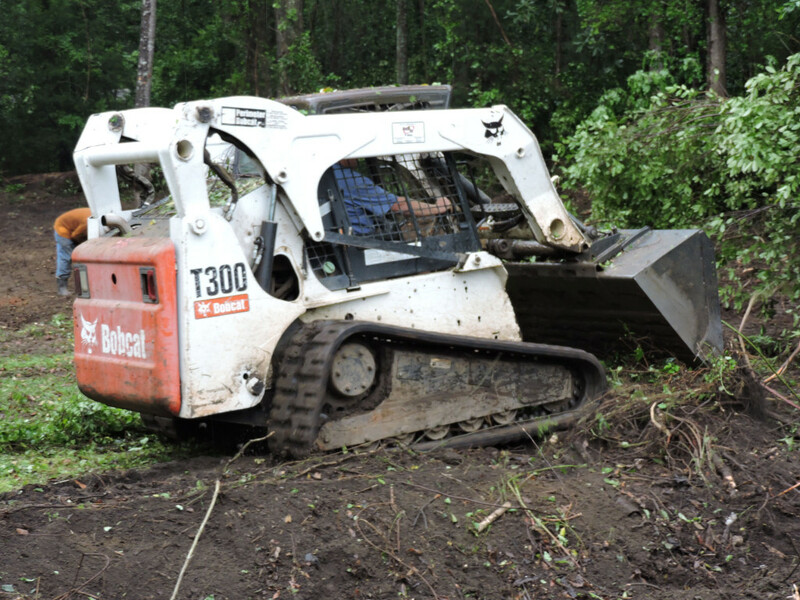 Using his backhoe, Michael Conner of Pinehurst clears brush and small trees from the edge of campground property. Current trustee chairman, Lee Guerry of Cordele and Skip Dawkins of Perry replace lights in the preacher’s tent. 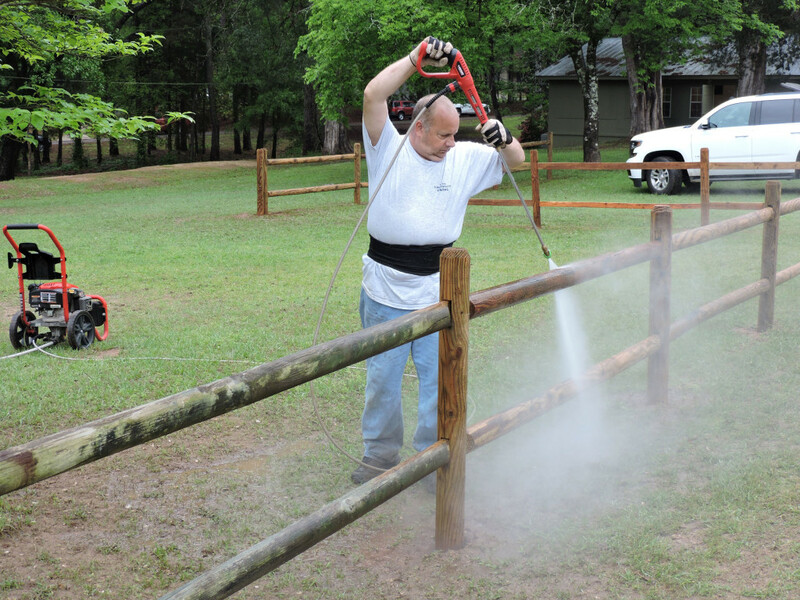 Bob Greico of Unadilla UMC pressure washes the wooden fence around the tabernacle during clean-up day. 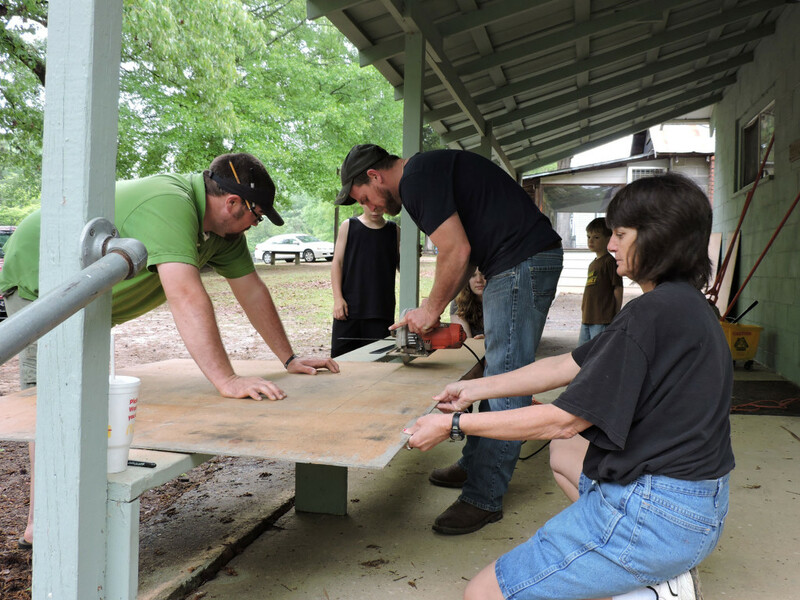 Chris Wooden, Dave Wooden and Theresa Brooks cut a piece of paneling to be installed in one of the campers’ dorms. 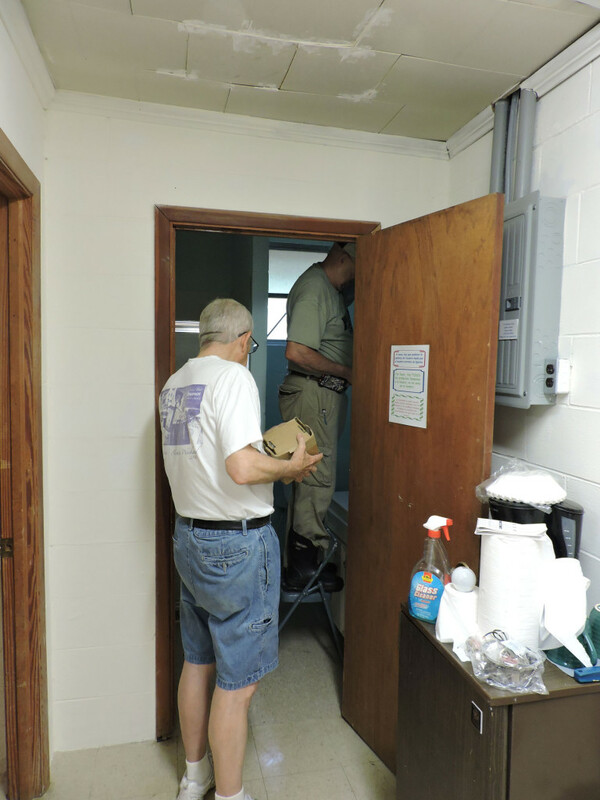 The trio are members of Andersonville UMC, and Chris Wooden said they are always happy to help out at Dooly Campground which is a special place to them.